You can win a free FEATURED Permanent Listing in DIRJournal. Just click the G+ button from the DIRJournal home page and leave a comment in this post. to share us with your Google Plus friends. Then leave a comment in this post. For your chance to win: Click this banner to go to the DIRJournal home page ~ Click the G+ button on that page to share with your friends on Google Plus ~ Then leave a comment in this post. Deadline to enter extended to Tuesday, January 1, 2013 noon EST. All email addresses from the comments left will be entered to win and the winner selected at random using random.org. Entries accepted through this coming Monday, December 24, 2012 [UPDATE – EXTENDED by popular demand through until Tuesday, January 8, 2013 at noon EST. The winner will be announced on Thursday, January 10, 2013. Would you like to get your business listed right away? You’re in luck. Simply go to the Submit Site page and use Coupon Code Holiday2012 to get a 25% discount. That’s all you need to know to enter to win. But consider this. 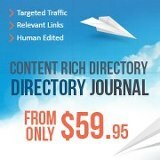 Help us spread the word about DIRJournal and leave me a comment in this post about what business you would list in our directory. I will be using this post to decide who and what to write about next – and your business could be featured. Give your business a push to the top of my queue by telling me where you shared this post and what you did to help us spread the word. Just click the buttons at the top of the main directory page and this post to share us on Google Plus, Pinterest, Facebook, Twitter, LinkedIn or StumbleUpon. Have you blogged about DIRJournal? If you did or do, share the link in the comments so we can check out your site and share your content. Together we can all succeed more quickly than any of us can do alone. Hey this looks very generous. And that’s really easy to enter. I just did the G+ and will be really interested to see how this works out. Thanks for the +1 and for entering. Good luck! Thanks Kristi. I can’t believe you’re already back at work! Wow. Tough woman. I recommended the DirJournal on G+. Great giveaway, really appreciate it. Happy Holidays, all the best to you. The business I’d likely request a listing for is my transcription service at http://ExpectPerfection.com It gets rave reviews by almost every client (some of which are listed at the top of the site). Where was the winner announced on Thursday the 10th?